This Tuna fish would make a great display for any Aquarium, Zoo, tropical, sub-tropical or nautical display. 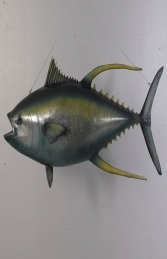 The Tuna fish could be used to promote your Aquarium, Zoo, nautical, tropical, sub tropical theme, Restaurant or your own home as a trophy of the one that got away! This model would compliment any of our other fish models available.